The green carpet tile ranges that we offer here at Carpet Tiles Next Day are extremely durable and long-lasting, all are suitable for commercial environments or busy workplaces. They can however, be just as successfully used in domestic situations, especially alongside the more classic colour schemes. Green carpet tiles are a sensible cost conscious colour, dark enough to hide most soiling in high traffic areas yet smart enough to give a professional ambiance and all sold at affordable prices. We also offer a tiered pricing system, meaning the larger your area size the more inexpensive the carpet tiles become. The green carpet tiles we stock are produced from both polypropylene and nylon, each option proffers a robust flooring opportunity. The colour which is often overlooked when considering carpet tiles is green. Here at Carpet Tiles Next Day we suggest that you should think again as this colour offers a smart, classical selection. We can offer three very different green carpet tile options, three subtle shades at three value prices for customers looking to lay floor covering in a commercial premises or alternatively for those seeking a change in their home. In addition to being hard wearing all our carpet tiles are produced with a 3mm bitumen backing, there is therefore no need for the use of underlay, cutting your flooring costs. For those on a tight budget we can offer our Omega Green Carpet Tiles, these are from our Fine Rib Range, manufactured using 100% polypropylene yarn. This type of fibre makes these tiles stain resistant and hard wearing. Though not advised for use with castor chairs, the Omega Green are a very suitable choice for hallways, foyers, meeting rooms or corridors where heavy traffic is common. The fine rib stitching of these durable tiles gives a corduroy effect to their surface, which when laid a quarter turn will offer a chequer board pattern. They are a mid-green shade with a slight woven fleck of white, this helps to hide any soiling that may occur in busy areas. 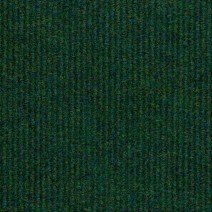 The Omega Green carpet tiles are also an ideal option in the home for utility rooms, games rooms or garden rooms or for use when updating caravans or motor homes. 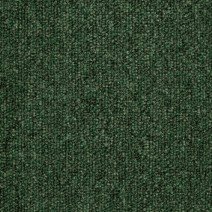 For a more robust rib tile, we offer the Broad Rib Richmond Green carpet tiles. These are a long-lasting, classic tone carpet tile and as the name suggests, with a thicker, broader stitching method than the Omega Green. These 100% polypropylene carpet tile are regularly sold for use in garden centres, public houses, churches and retail areas. If you are thinking of using your home garage as a room these would again be a perfect selection, easily cleaned, lifted and replaced they are a top-drawer carpet tile. The dark green base colour is enhanced by the addition of subtle blue, brown and tan fibres. 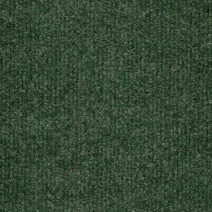 Landmark Green carpet tiles are the selection available in our nylon Carpet Tile range. These rich, soft carpet tiles are perfect for any commercial application, being castor chair suitable they would be highly recommended for your office or conference room. They are an appealing green loop pile carpet tile intermingled with bottle green, sage and dark silver threads, this colouring also makes them just as suitable for the home in almost any room you choose. Nylon fibre carpet tiles have the longest life-span of the tiles that we offer, their longevity makes them a cost effective option. All of our carpet tiles can be either loose laid or stuck down. For small areas of less than 100 tiles loose laying is acceptable, perhaps using the double sided carpet tape near doorways for safety. If laid in a heavy traffic area, the tape should be used to prevent trip hazards. For larger areas we would recommend using the carpet tile tackifier. This is a special liquid form (pressure sensitive) adhesive which allows the lifting of the carpet tiles for cleaning and replacing, while preventing any lateral movement. Both products are available for purchase on our site, as is a fitting kit for those who do not have the correct tools available. Carpet tiles are easy to fit and we find that the work is often performed by the purchaser for themselves, we have a downloadable PDF fitting guide on the website to help you along your way.